NETWORK UPDATE: SUNDAY NIGHT FOOTBALL adjusted to 6.7, a big 1.8 below last week’s Sunday game. Elsewhere, the President’s Oval Office speech led to plenty of adjustments: THE SIMPSONS dropped 0.7, BROOKLYN NINE-NINE fell 0.3, and ONCE UPON A TIME fell 0.1, while QUANTICO gained 0.1. CABLE HIGHLIGHTS: The big question of the cable night was how AMC’s INTO THE BADLANDS would respond to losing its WALKING DEAD lead-in, and the answer was that it plunged by about 57%, down from 2.46 to 1.06. That’s a hell of a loss, but a rating over a 1 is still nothing to sneeze at (especially on the network that renewed TURN and HALT AND CATCH FIRE), so if BADLANDS can maintain at that level, it’s still more likely than not to be renewed. (By way of comparison, BETTER CALL SAUL had a 1.63 rating in its first airing without a WALKING DEAD lead-in.) Without WALKING DEAD in the line-up, Sunday honors belonged to Bravo’s REAL HOUSEWIVES OF ATLANTA, up 0.16 from last week to 1.44. However, lead-out WORK OUT NEW YORK didn’t hold that rating at all well, slumping to 0.37. On E!, KEEPING UP WITH THE KARDASHIANS gained 0.21 to 1.10, while THE ROYALS rose 0.07 to 0.31. Discovery’s ALASKA THE LAST FRONTIER jumped 0.24 to 0.81. 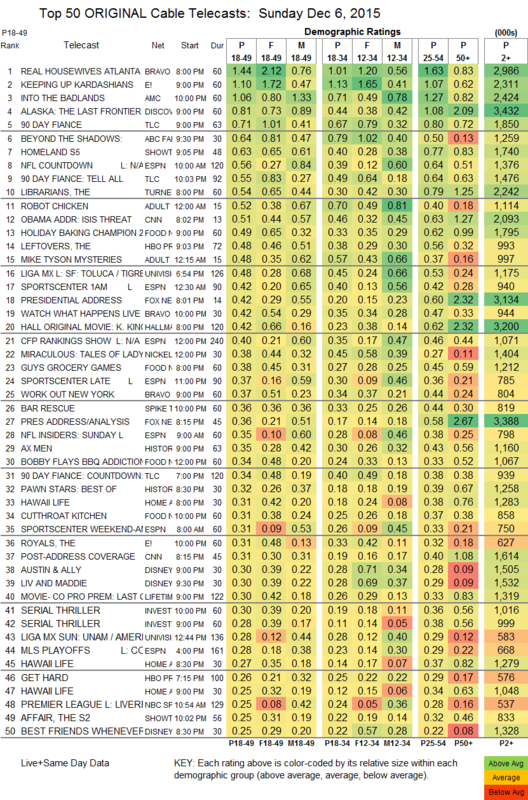 TLC’s 90 DAY FIANCE increased by more than 50%, up 0.25 to 0.71, and a TELL ALL special was at 0.55. ABC Family had to be happy that its preview of the upcoming SHADOWHUNTERS, a special called BEYOND THE SHADOWS, scored a solid 0.64. 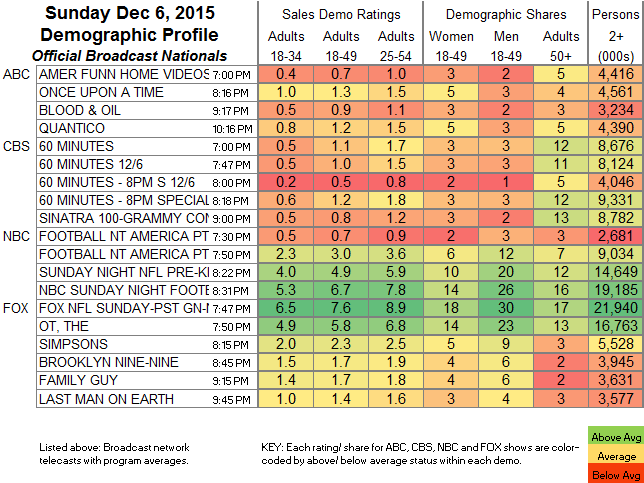 On TNT, THE LIBRARIANS ticked up to 0.54, but AGENT X fell 0.03 to 0.20. On Adult Swim, ROBOT CHICKEN was at 0.52, and MIKE TYSON MYSTERIES was close behind at 0.48. On Food Network, HOLIDAY BAKING CHAMPION lost 0.04 to 0.49, GUY’S GROCERY GAMES dropped 0.05 to 0.38, and CUTTHROAT KITCHEN fell 0.07 to 0.31. The night’s Hallmark holiday movie KINGSBURY was at 0.42. The final COLLEGE FOOTBALL PLAYOFFS RANKING show for the season was at 0.40. History’s AX MEN lost a tick to 0.35. Logo’s RUPAUL’S DRAG RACE dropped 0.01 to 0.02/53K. There was some good news for both HBO and Showtime. HOMELAND gained 0.15 to 0.63, although THE AFFAIR eased by 0.02 to 0.25. The season finale of THE LEFTOVERS climbed 0.08 to 0.48, but GETTING ON lost 0.02 to 0.09. At Starz, FLESH AND BONE shed 0.01 to 0.04/122K.